My departure time for work was hours away. 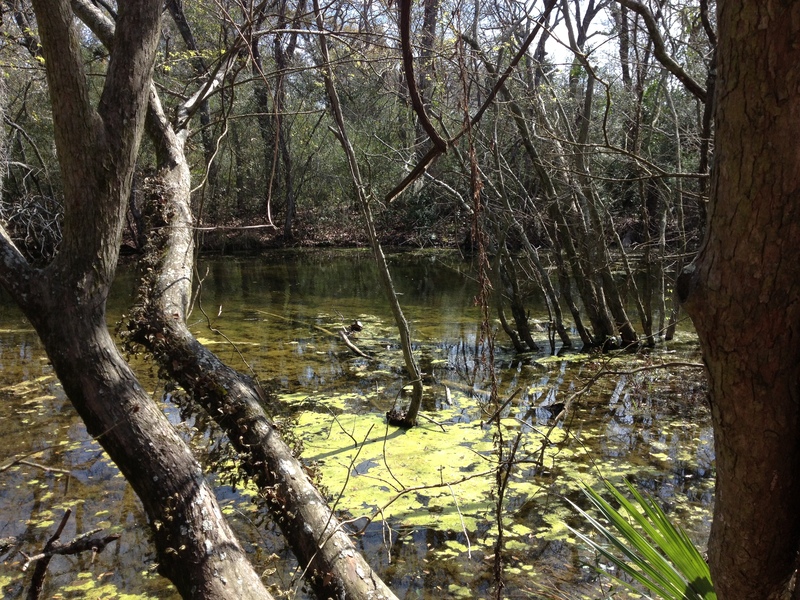 I gathered my gumption and headed off on my bicycle to hunt for alligators. My only weapon was my I-phone camera. I have heard stories of these reptiles making visits in our neighborhood. One family was startled when a five foot gator used their doggy door and relaxed on their kitchen floor. I was glad that we don’t have a pet entrance. My neighbor laughed and assured me that we would have to live a lot closer to the waterways to experience a story like that. Still, I wondered where these creatures lived when they weren’t invading the domiciles of us average Homo sapiens. That’s the curiosity that got my trip on two wheels humming. Maybe the morning sun would bring these beasts out into the open and I could witness one living in neighborhood pond. South Peek is a pleasant road for an easy ride. Two and a half miles into my ride I spied my turn-off up ahead. A pedestrian walkway was zebra striped on the asphalt with bright yellow pedestrian signs accompanied with flashing lights. 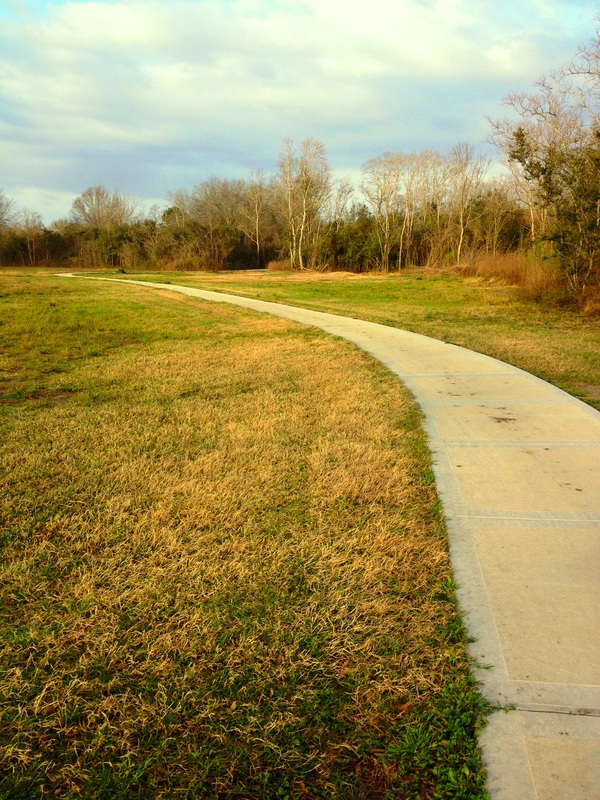 I turned on to the pathway that was part of the Buffalo Bayou Trail. It wasn’t long until I turned again. Within a hundred yards from S. Peek Rd a sign on the Trail pointed to an Observation Deck. 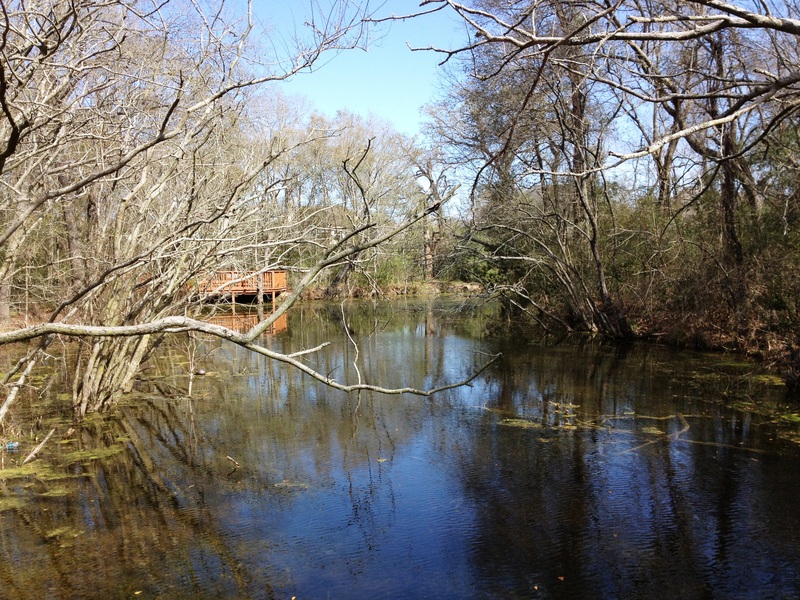 I followed the pathway to a wooden deck built over a pond. Before a I went further I looked carefully all around the deck. Nothing seemed suspicious. I rolled my bike on the platform and saw the warning sign. Officials have posted a warning. 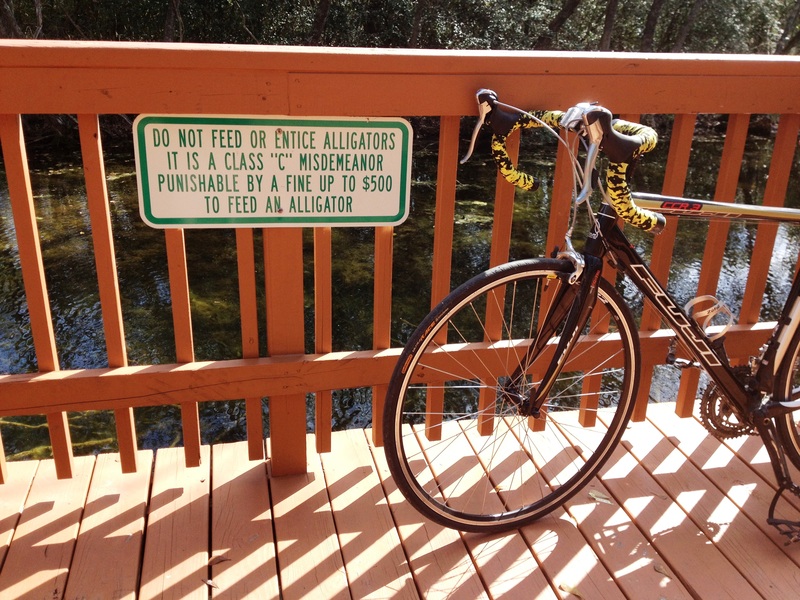 Feeding or enticing the alligators was a Class “C” Misdemeanor. It could be punishable by a fine up to $500. Naturally, I comply to the laws that govern our land. I was not interested in breaking the law. Instead, I simply wanted to see an alligator in our neighborhood. 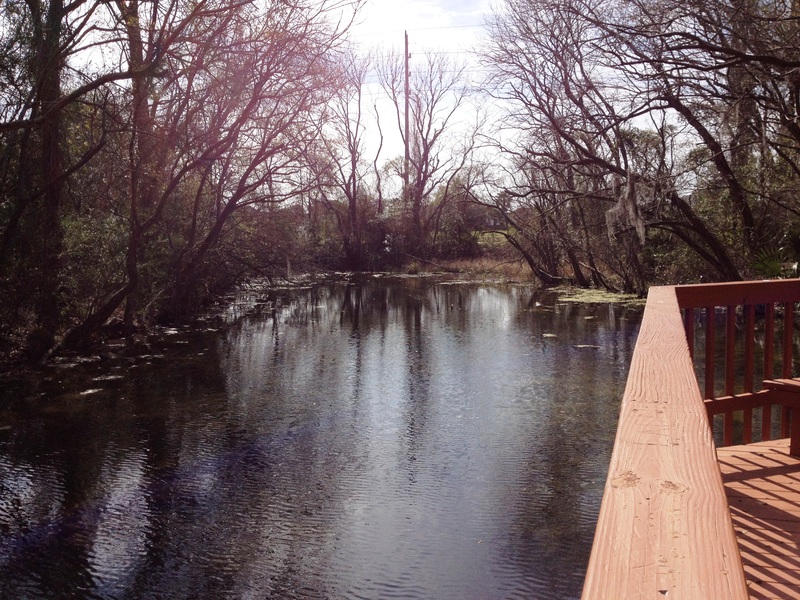 Carefully and quietly I peered into the waters surrounding the deck. Nothing. I walked over to the other side and again scanned the waters and the edges but there were no reptiles to be seen. On a log, however, there was a large terrapin. He was sunning himself and holding perfectly still but he was obvious. No alligators but the sign still is rather exciting to have in the neighborhood. It certainly captures my attention. Maybe some day it will come true. April 15 is not a favorite date on anyone’s calendar. It is more than a deadline. It is more like a doomsday foreboding boogeyman ready to pounce. D.C. doesn’t help. All of the vitriol on the Hill annoys most of us hard-working Americans. Those are the guys using words to confuse the general public to hide raising taxes. Hey, how come all of us are watching our expenses, cutting back on vacations, scrimping on trips to save on our expensive gas bills while the lifestyle in D.C. is booming? Well, whining doesn’t help change the government. 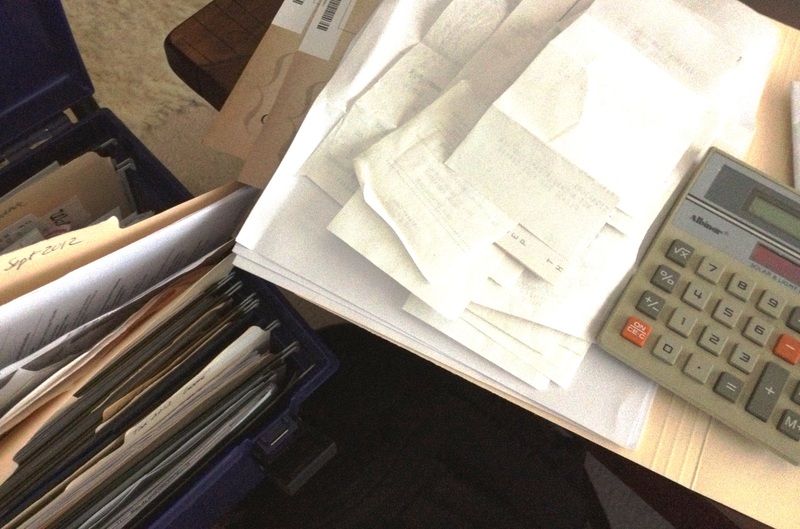 It does give a lot of relief while collecting receipts, reconciling documents and double-checking deductions. My calculator is solar-powered, so at least I don’t have to pay for new batteries. Most of the year I spend a great deal of energy on being positive. I look for reasons to be cheerful. Joy is under some rock out there. Preparing my taxes is simply a matter of addition. It is a lot of addition. Piles of receipts have to be organized and tabulated. No one else can do it. It’s a solo task. During the year I try to keep organized. My file system is ready to catch a handful of receipts whenever I throw them in my cabinet. I graduated from separate shoe boxes decades ago. Nevertheless, the sporadic task is very similar. Now, with the deadline within sight on my calendar I plod on through my addition like a weary traveler slogging it through deep Michigan snow drifts. Often I pause and remember the great fellowship that those receipts represent. Sometimes it was hanging out with a fabulous staff. Other times it was spending time with people who were guests to our church, men to talk to about the next steps in committed living or encouraging members who needed some shepherd time. But, alas, the IRS is not interested in the back story, they only want the bottom line. There is a number that they want. I want to give it to them. Time to push on, add more numbers. Summarize more categories. Funnel numbers down to one final addition. It will come. I will get there. Eventually, the organized files will spill out the final sum. Hey, look at this. I remember when we met with those people and talked late into the night. It was fun, deep, meaningful…hey get back to addition. The deadline is closing in. It is virtually impossible to drive on a Texas freeway system and not see an advertisement for the next Buc-ee’s (pronounced Buck-ee’s). When we moved to Texas last year we passed at least two of these gas stations. While we never stopped I never forgot what a curiosity they were. good description. 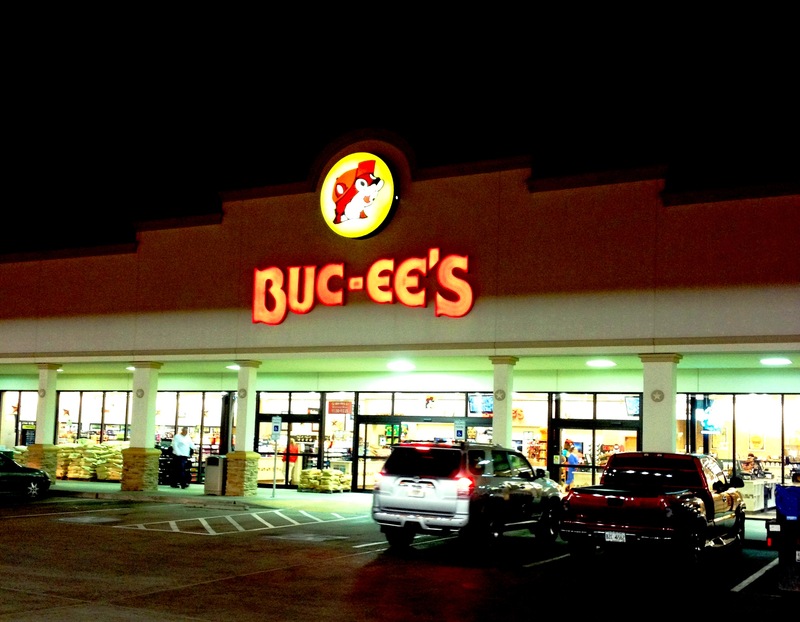 Finally, our travels took us for a visit to Buc-ee’s. When we stepped into the store, we both exclaimed, “Wow!” It was a gas station on steroids! A long corridor was lined with household products, cowboy and cowgirl wear, outdoor supplies, hunting gear and hats galore. That’s just the first half of the store.actually have beavers in its Eco-system? The other side of the store is all about food. There is a deli, fudge counter, grill with computer screen for self-orders, popcorn of every imaginable flavor, candy, nuts and every other kind of confection that you can create with your sweet tooth. I stopped to take a look at the western wear. There was a hat or two that I liked. Some of the outdoor gear looked really good too. A pair of boots caught my eye but I have all the footwear that I need back at home. 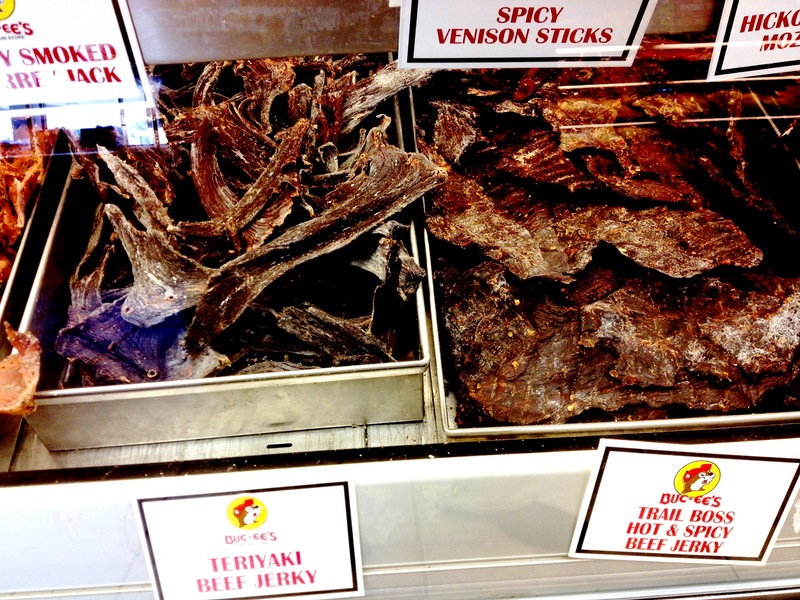 The variety of jerky made my mouth water. Meat sticks tried to beckon me closer for a whiff but I resisted. While I picked up several bags of popcorn, I put them all back. We found some trail mixes that accompanied us home. A sausage on the stick made it into our car as well. Fudge topped it all off with a cheery smile. Before we made the long trip back home it was time to visit the restrooms. You have not been in a public restroom until you have seen a Buc-ee’s restroom. They are amazing. How can you be amazed at a Men’s Public Restroom? You gotta see it. It’s like a Restroom on steroids. Our route was new for us. Linda, our GPS navigator announcer, was leading us down streets that were close to major freeways but we had never been underneath nor on frontage roads like this in our past. Others knew the route and raced to secure a lane that left me watching alertly for options along the way. Suddenly, below the Sam Houston Beltway 8 I saw a vision that captured my eye. A parking lot was filled with all kinds of vehicles. Scurrying around in that lot were many people all on bicycles. Dozens of riders were going back and forth across a bridge clearly designed for pedestrians and riders only. There were serious riders mixed among the casual cyclists. Excitedly, I pointed at the gathering point to my bride. The next chance that I had I was on the computer looking for this location and wondering where the route led, how to get on it from my side of town and wondered how long it was. Eureka! My search engine struck gold. 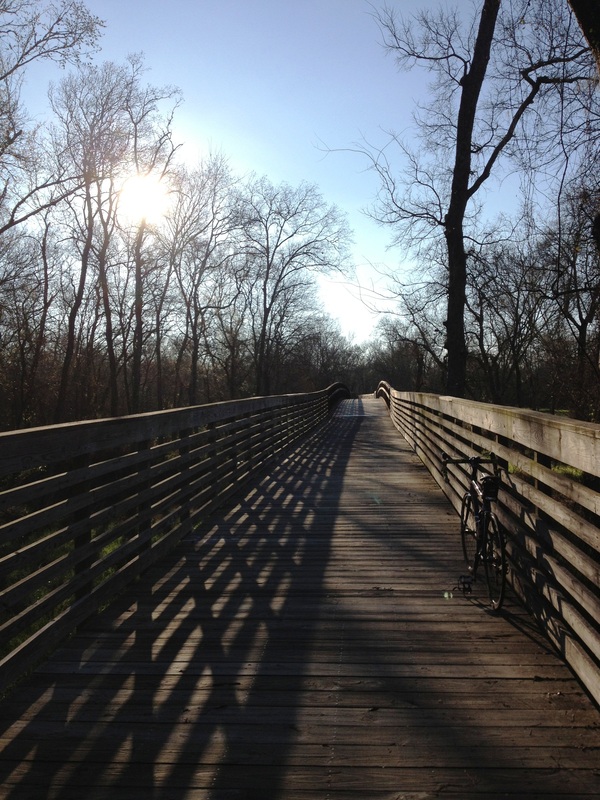 The Buffalo Bayou Bike and Hike trail travels East and West. No motorized vehicles are permitted. Feet and pedal power is the limitation. Three miles from my home I could pick up the trail. I had passed it a number of times and wondered where it would lead. Now was the time to explore. My Fuji mount was ready to go. It carried me South of Westheimer Rd to a marked cross walk. Blinking lights warned motorized traffic to watch for pedestrians and bicyclists who were crossing the road. I turned on to the pathway heading East. It was a work day so I only had a limited amount of time to explore the possibilities. Initially, I was not liking the trail much. It would weave in and out of shrubbery areas making it very difficult to see any oncoming traffic. That meant that the ride was very slow. After a mile or so, the trail started to straighten out. I picked up speed, negotiated a few street crossings and called out an alert to pedestrians. 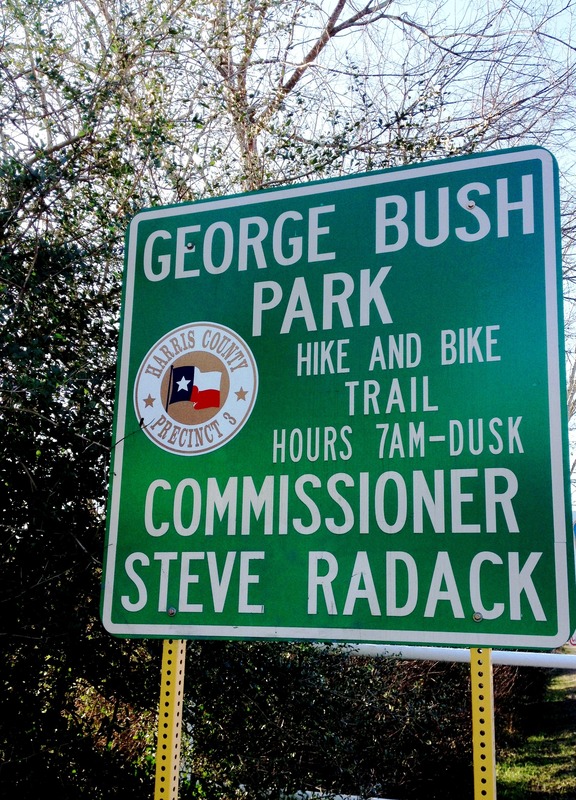 It wasn’t long before the trail entered the George Bush Park from the SW corner. Now, I was sailing. Mile melted after mile. Excellent concrete bike roads made for a quick ride. There enough easy turns and twists to make the journey interesting. Now, if the wildlife would just stop being so shy the ride would have been fabulous. Every student at Dallas Seminary loved their required class with Dr. Howard Hendricks, affectionately called “Prof”. It was there that our lives in ministry would be marked with a lifetime of skills for independent Bible Study. So many of our lives begin the day with Observation, Interpretation and Application. As a Senior at DTS, I set my sights on an elective class taught by Prof. It was a class on Discipleship. However, the class had a very limited enrollment but the challenging prerequisite was a personal word of approval from Prof himself. Getting approval from the Prof was going to be tricky. He was always surrounded by students, colleagues and getting an appointment with his office staff would never be in time for the enrollment deadline. My plan was to intercept him at the end of chapel in the hallway where the faculty filed out of the service. I occupied a seat in chapel near the front, next to the door leading into the faculty hallway. During the closing prayer I slipped out of chapel, exited through that door and waited. Faculty members streamed out of their loft and I tried to be inconspicuous. Prof’s laugh and voice broke the din of noise. He was in conversation with his colleagues, I followed. There was never a break in Prof’s stride as I followed like a hungry puppy looking for crumbs to pick up. In a break in his conversation, I called out, “Hi Prof!” He never slowed, cocked his head toward me, “Yeah, Fong, what’s up?” Startled that he knew my name I tripped over my own tongue, stammering out my request, “May I have permission to enroll in your Discipleship class?” “You got it, Man! See you in class.” I floated out of the chapel. Years of ministry followed seminary. Then, I was honored to step into the position of President of a seminary. I invited Prof to be my inaugural speaker. He accepted to be a part of that very special day in my life. It was amazing. Once during the busyness of leading a ministry of God my phone rang. “Hey, Bruce, this is Prof calling. Don’t need anything, just called to tell you that I love you.” Click I can still hear him speaking those words from that phone call today. The next time I see Prof will be in heaven. He graduated into the presence of His Savior today. 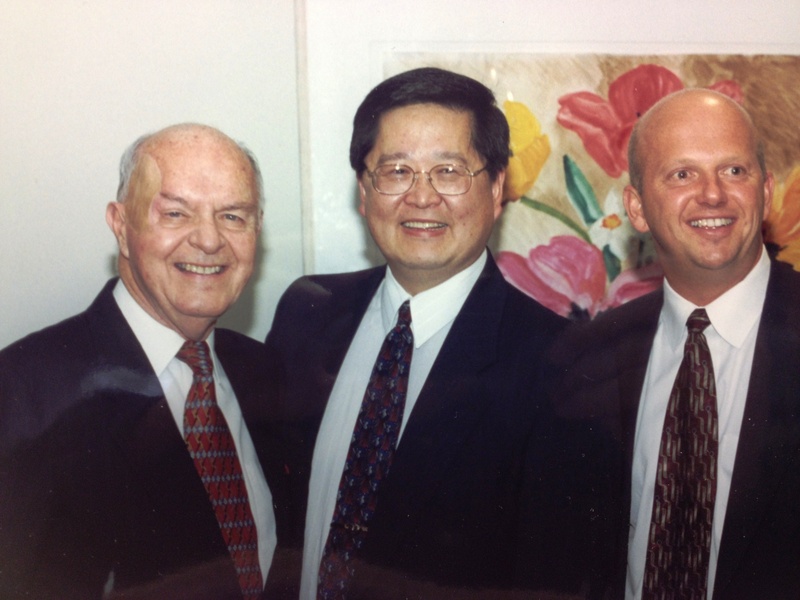 What a blessing to be a part of the amazing legacy that he has left behind. I loved that man. It is not infrequently said that the desert has its own kind of beauty. I don’t know who said it but I have heard it quoted. Frankly, it’s something that accept and in fact believe. My first junket into the South Texas brush land reminded me of this old adage. Sunny skies seemed most appropriate. Flat landscape for miles was the order of the scenery. Mountains did not exist. Occasional gullies or mounds of sand broke the monotony of the landscape. That, however, was while we were bombing down the highway at posted speeds. When I left the vehicle behind and began to walk, things began to look very unique. A rabbit scampered across my path. It paused to turn around and look at me. Then, it disappeared into the brush. A few more steps and I was startled by a covey of quail. They flushed from a low growing shrub. I don’t know how they remained hidden until I was right on them. My boots kicked up sand as I continued my hike. Ahead a road runner scurried quickly across the dirt road. He was after a morsel for his morning meal. They are curious looking creatures and move with such swiftness, that only a creative God could have called that remarkable bird into being. Then, I paused. My eyes were captured by the oddity of a cactus. Odd might be a harsh term, more characteristic of me as a city dweller than someone who appreciates life in its various forms. The oval green paddles of this cactus are curious. 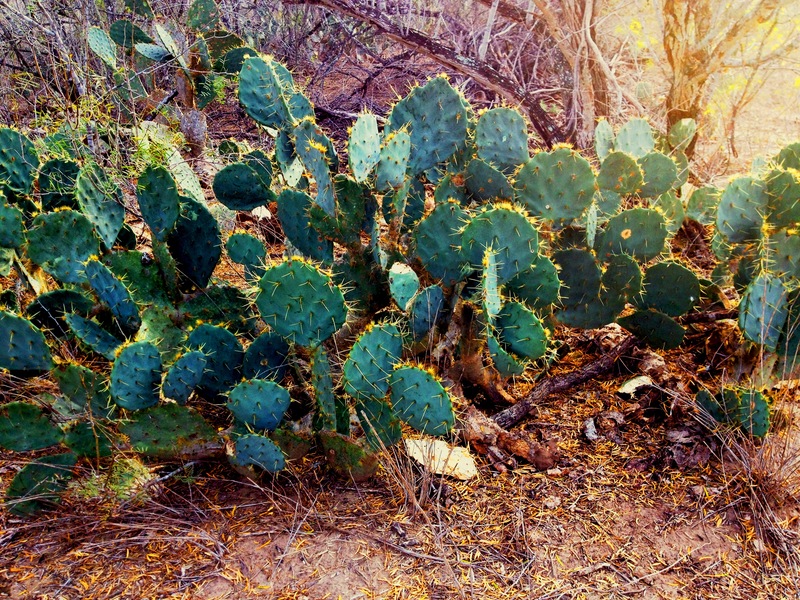 They are lined with prickly thorns. Animals would not want to get close let alone nibble on these painful guardians of the ground. Here is the desert in part of its beauty. No other plants around were as green. Clearly there was special life in these plants most suited for desert living. The long-standing drought in the desert has killed some much of the grasslands and shrubbery. The cactus keeps on staying around and growing, albeit growing slowly. Its unique almost exclusive display of green was remarkable. In some ways it seems like a chaotic undisciplined growth. Then, on closer examination, God designed the plant with remarkable symmetry. The paddles were the same shape. There very little that haphazard about the Creator’s masterpiece of thorny growth. It is certainly different. This plant is not a copy-cat. That in itself is beautiful. Most of my attempts to buy store-bought cookies is a surrender. These mass-produced morsels are usually a major disappointment. You have heard of the popular ones. In fact you most likely have eaten them, even liked them. Now do a quick honest comparison. When you have home-made cookies, there’s no comparison, right? NO comparison. Those made by mom, auntie, granny or sweetheart are just in a different class by themselves. Life gets busy, though. Sometimes those wonderful bakery morsels are few and far between. That’s when store-bought cookies can give you a ration between home-made treats. They never compare but they will do in a pinch. 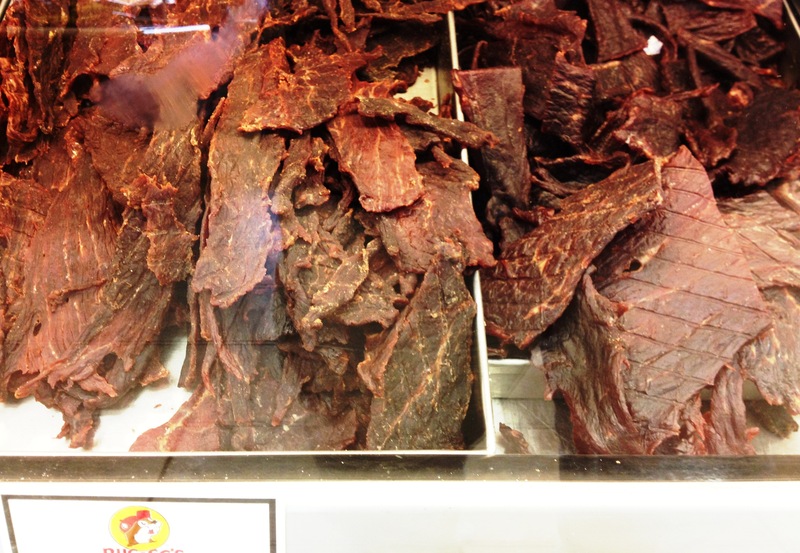 Recently, we were wandering around in a newly opened specialty store. It is a new grocery store to Houston. We were familiar with this destination store during our days in Michigan and California. It is called Trader Joe’s. In the past we were regular visitors to this establishment. They have unique products. No they aren’t a massive box store, but their selective options make it a fun destination. One of the options that makes this store unique are the “store-bought” cookies. Yes, they are different here. In fact I would say that they are good, very good! When God made man, He gave us taste buds. They let us know when something that we eat is good or bad, enjoyable or not. We took a chance and bought some caramel pecan cookies. After a long day and many chores completed, we relaxed for the last couple hours of the day. We opened the package of cookies and each tried one. Shazaam! They were good! Quickly we closed the package and sealed it tightly. We didn’t want to overindulged on this new discovery. Now it is ration time. Before the course of time makes these delicious treats stale we will consume them as our occasional dessert. It is fun to anticipate something that had such a good impression on us both. Do you remember the last “really good” store-bought cookie that made you pause? You take an initial bite into the confection. There are no real expectations of anything remarkable. Past experiments satisfied a moment of flavor enjoyment but there is something missing from store-bought cookies that makes every subsequent experience flat-line on the experience meter. This time there is a surprise. Our taste receptors sing! We look down at what we are eating, even if it means breaking off a conversation with someone or taking our eyes off a book that we are reading. No tells us to mark this moment but cookie reminders in our brain tell us to bookmark this selection. Yum! My bow felt comfortable in my hands. The grip could not have been more ideal even if it had been custom fitted for me. It was just one of those meant to be connections with a mass-produced martial weapon as this. Held in my left hand, this bow would be managed by my weaker side. Yet, the weight was deftly balanced with a counter weight and vibration dampener. Each limb was identical to the other and ready to load up 60 pounds of power to the missile that I would launch. 20 yards out was a cube of dense foam. It was designed for archery exercises. The science behind the target would allow this lightweight arrow catcher to absorb countless hits. The target is in my sites. I set an arrow in place. When I draw back, the compound bow lets off and lets me hold the power in place with only half the effort. My sighting pin is at the bottom of three. The sun illuminates the pin like it had batteries juicing a miniature light. Meticulously, I line up my 20 yard sight pin with the target. Martial artists now blend their mind with the arrow and mentally send it to the target. It is a feeling, a mood, a sense that it is aligned perfectly. No one can tell you when to release the arrow. It is intuitive. I squeeze the trigger release. Amazing power suddenly explodes in silence. The arrow speeds toward the target at 210 feet per second. 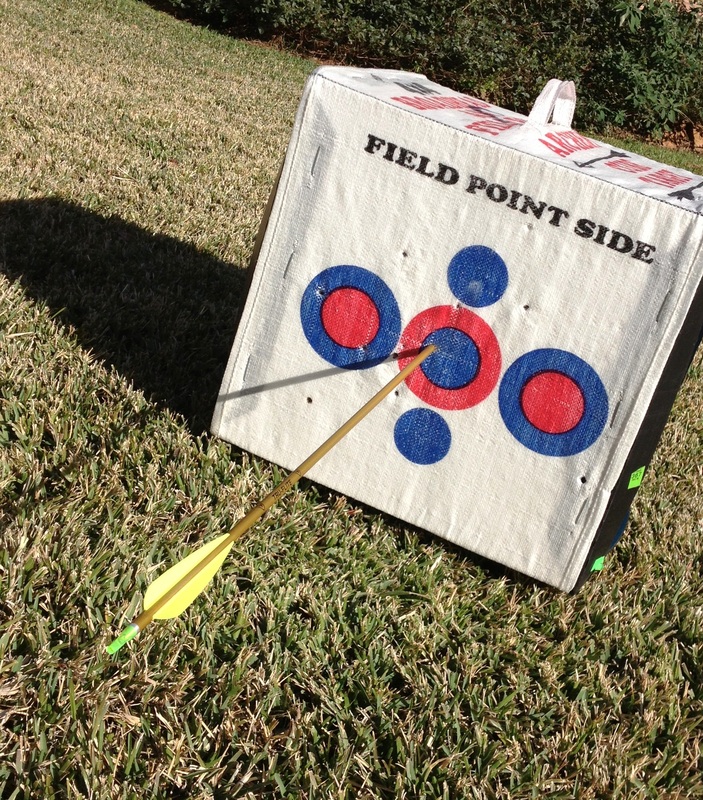 In less than 1/3 of a second there is a distinctive “Thwack!” when the arrow buries itself in foam target cube. My bow leans forward slightly, weighted by the balance and the follow-through. Then, with eyes locked on the target I nocked another arrow. Without glancing down, I attached the trigger just by feel. The motion to draw the second arrow, tuck the string and align the sights was merely an extension of my body. Again the release was smooth and fluid. In flight the arrow as just a blur. It too stuck in the foam block with rattling force. Again the motion repeated itself. A third arrow vibrated slightly as it penetrated the target. Then, a fourth, fifth and sixth arrow hit the block. Beyond the outstretched arm of man, an extension has been bridged. An art has been formed between mind and matter. There is a blend that the image of God is able to experience with concentration and focus. We are fearfully and wonderfully made. My first journey into the vast expanse of the George Bush Park raised many curiosities. History feeds those mental questions and spawns new ones. Rabbit trails of wonderment splash across my mind. Harris County is my home. Besides consuming most of Houston, my town of Katy, Texas is partially included in this geographical designation. It is a very small sliver of Katy, nevertheless, that is where our home is. Providentially, our home is close to this new discovery. One of the several entrances to the park is a mere 3.2 miles from our front door step. We explored its location after a tip from someone we had met at church. In my mind I calculated the route to this trail headway and planned to make a visit some day. That some day was now. Texas drivers courteously let me have a safe ride on narrow streets for a safe arrival to continue my ride. Signs introduced me to many parts of this destination. Some were informative. Others were curiosities. The warning sign indicating that a bridge was out at first seemed foreboding. Have you ever imagined a horror movie with an abandoned bridge hiding ugly monsters ready to gobble up naive travelers? This flashed in my mind momentarily. Thoughts of turning around did skip through my decision-making cortex albeit briefly. After all, other riders and joggers were come from and going to this same destination as I was. At the very least I would travel on and do an assessment once I arrived at the corrupt expanse. Maybe if I got up enough speed I could jump the canyon. If the expanse was too great, perhaps I could descend the cavernous gully and climb up the other side? Then, again maybe I could pause and build a new bridge with my bare hands. Then a mere 1500 feet from the “out” bridge a second warning sign was posted along the trail. This time it moderated its warning. 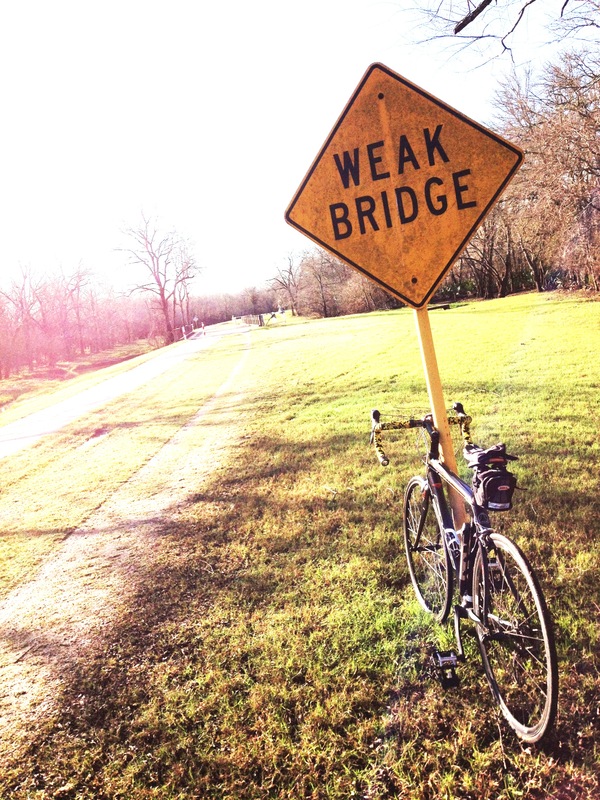 The bridge was NOT “out” but rather designated as “weak”. Bah! Someone was being extra careful. This was a situation that I would have to see for myself. Now, my curiosity was growing large. 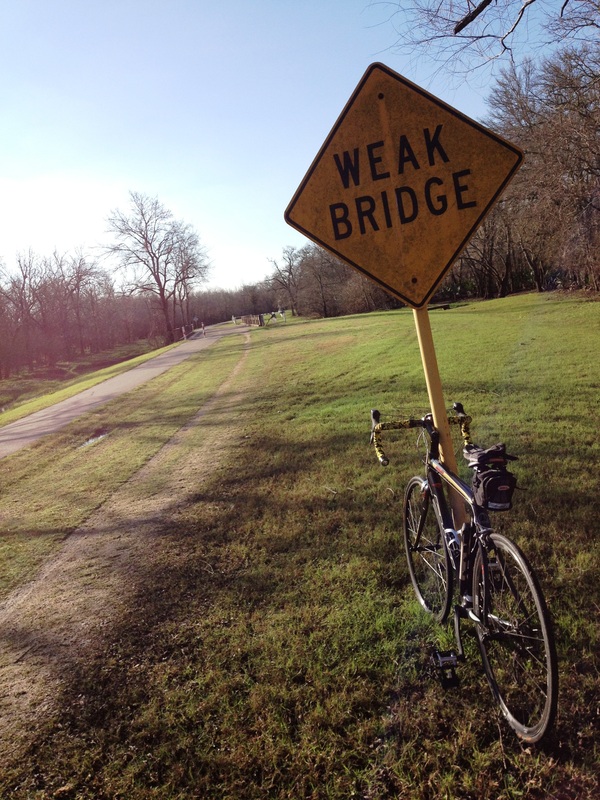 I rode up to the bridge. The structure was an old concrete bridge. 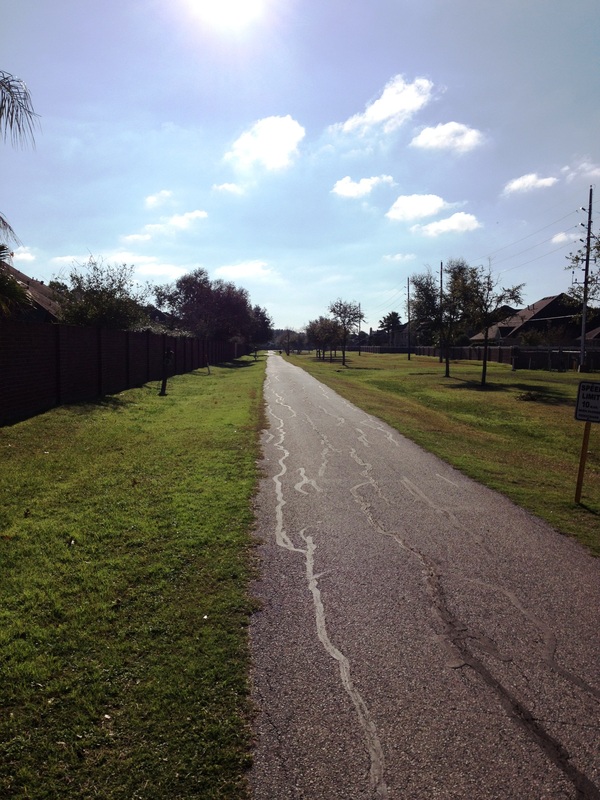 It was wide enough for motorized vehicle traffic and 30 yards long. Clearly it was more than strong enough to hold foot and bicycle traffic. Not even slowing down to cautiously cross, I raced across without breaking stride. It held up . . . both times! 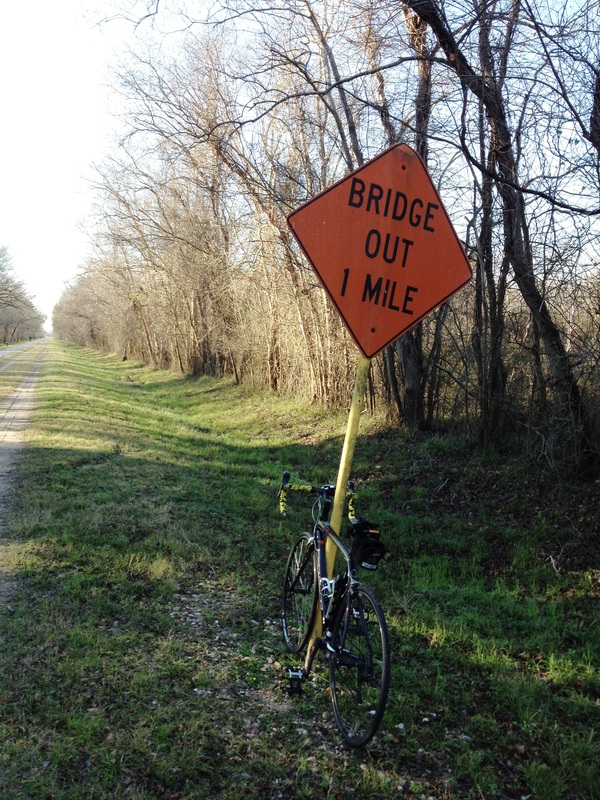 Bicyclists know that the first 20 mile ride is the portal into the world of distance riding. Road bikes eat up miles like asphalt is going out of style. These are the pedal power pumpers with light weight bikes, sleek clothes, stream line helmets, padded gloves, slick sun shades and matching shoes. They move with ease through automobile traffic. Deftly, they dodge cars, trucks and buses en route to their chosen destination. Their power strokes from their spinning legs look like a windmill. In my season of life I am not in their league. But, it is a great activity. I have been told that bikers look at the rite of passage on road riding and universally accept this 20 mile ride as a first step. Before I left our home I made all of the fine adjustments on my mount. I wiped my Fuji down so that it looked good. Hey, if my workout was going to be historic, I might as well look good while doing it. Then, I pumped up both tires to the optimum 110 psi. Brakes were in good order. In my seat pack, I had spare inner tubes, tire changing tools and a patch kit. 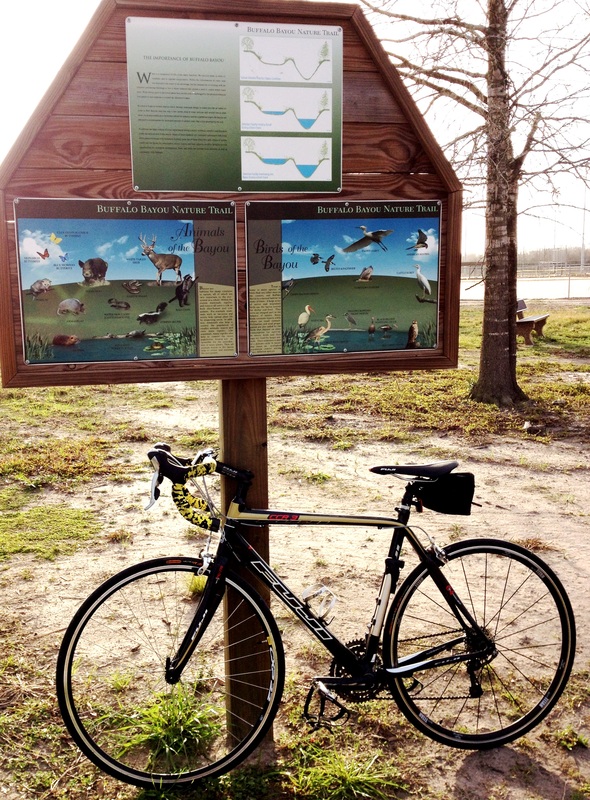 It was a 3.2 mile ride to the trail head of the walk and bike path located in the George H. Bush Park. Once I entered the park, I felt the relaxation sweep over me. There was no traffic to threaten my safety. Now, the only surroundings were trees, shrubbery and acres of grass. Deafening sounds of vehicles were gone and the songs of birds, whistling of the wind and the simple sound of my tires rolling across the asphalt trail were the peaceful reverberations of the morning. I was going to enjoy this ride. Woods engulfed me as the trail wound through a collection of trees. Ahead the terrain turned into marshlands. A boardwalk had been built and elevated all travelers above the wet grounds below. A stream muddy from the runoff from yesterday’s rains turned this slow body of water into chocolate milk. Resting in the middle was a large Blue Heron, stealthily hunting for its breakfast. Egrets were trying to copy this master of bill fishing. Miles melted behind me. I was only guessing how far I had ridden. Then, a map on a board measured distances in the park. Quickly, I added up distances and realized that I could actually complete a 20 mile ride. I did. It was great. I have passed through the portal of long riders.